Click here to read part one and part two of this series. The results of the survey were sent home with every child. What I loved about the survey was that the day care listed every food item they have on their menu, they added more information about the food (canned versus fresh fruit), and then asked a simple question about frequency with straightforward answers (Keep as is/Remove/Increase frequency/Decrease frequency). 1) The vast majority of parents are highly satisfied with the food at daycare. Most people clicked “Keep as is” for all the food items. Approval ratings hovered around 90%. 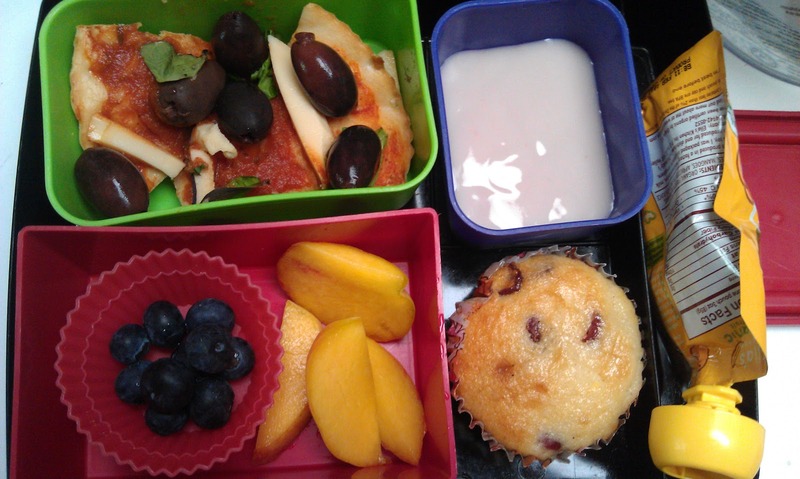 For example, the blueberry muffins that the day care gives out at snack time, and sometimes as part of the meal, are junky. The mini-sized Spunkmeyers are undoubtedly made with white flour and all look identical like they came straight from the factory. Maybe I’m one of the few parents who has seen the cook deliver these to the rooms, but on the survey 94% of parents said “Keep as is” for the muffins. Disappointing. 2) Parents don’t mind about the ice cream. Eighty-nine percent of parents agreed that ice cream should be kept as is. Seriously? In our house, ice cream is a seasonal food. My little guy barely had any ice cream all winter (maybe once a month), but now that it’s getting hotter, he has gotten ice cream twice this week already. I really want to be the one to determine when he gets this special treat. 3) Fresh fruit is in while canned fruit is out. For snack time. a whopping 25% of people want to increase the frequency of fresh fruit on the menu and 10% of parents want to decrease canned fruit. 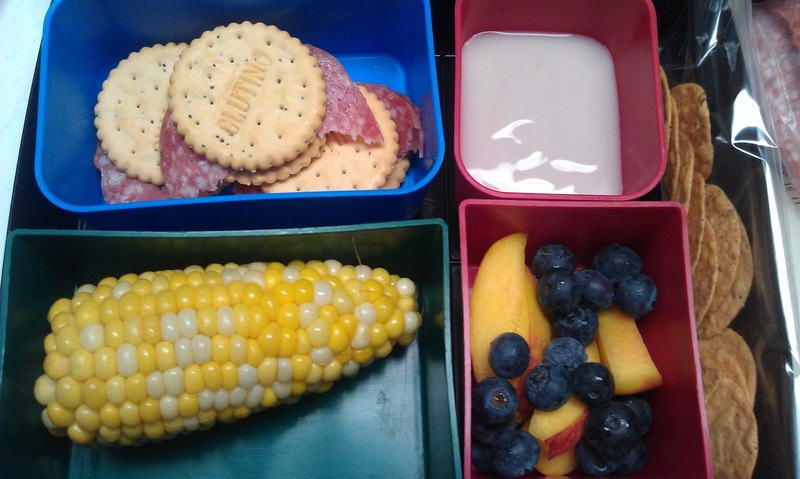 And for lunch the number of parents interested in decreasing canned fruit rises to 19%. 4) Less beef and more whole grains. The survey respondents want less beef (8%). When you scan the monthly menu, ground beef is offered at least twice a week. It’s excessive in my opinion. Parents want to see increases in whole wheat bread (15%) and spaghetti (7%) and they want to drop any remaining white bread (10%). For what it’s worth, I have never seen the kids with white bread. 5) More soup and more chicken nuggets!? Parents want more chicken soup (7%) and, even more surprisingly, 8% of parents want more chicken nuggets on the menu. This is where the ingredients matter. I’d welcome made from scratch chicken soup (without the MSG that’s in canned soups under various aliases) and scratch chicken nuggets (no pink chicken foam), but I don’t see that happening at my son’s day care. They have a cook, but that’s only one person for a few hundred kids. I think they’d need more personnel and space to make healthier food. When I pick up my son, there’s a super chatty guy behind the counter and we talk a little bit. It must have gotten around that I sent in the letter because he started telling me about the new snacks they are looking into. He mentioned that the manager is redoing a least part of the menu to make it healthier. 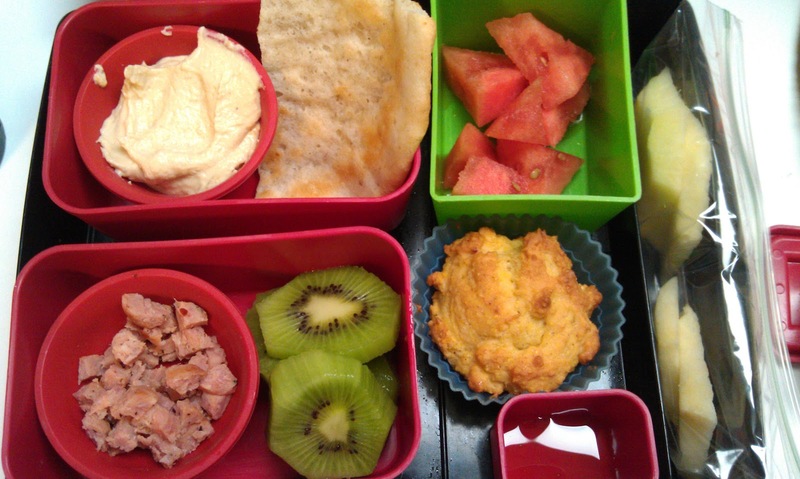 I have a feeling that I’ll be blogging even more about day care food in the future. I think that my letter requesting a parent survey was a tipping point. They must have already been thinking about change and needed a little push. Honestly, we pay a small fortune for day care for our son ($1,100 per month) and they enrich the kids’ experience with music programs and special visitors. Now that the day care is taking a closer look at the food, it can only make the place better. 1. Site redesign – I’m excited to announce that it’s coming soon. For those of you who subscribe via RSS, I’ll be giving you instructions on how to continue subscribing. Unfortunately this feed won’t automatically be redirected to the new URL, which is also forthcoming. Hang in there! 2. 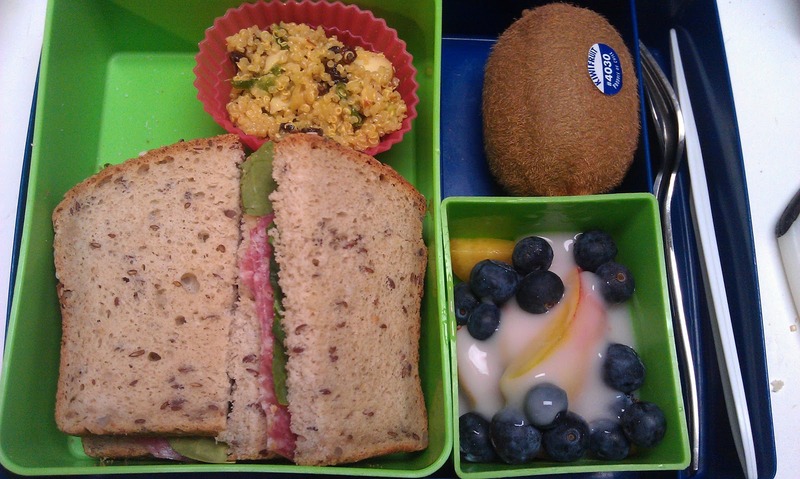 Daycare food update – Holy cow, the daycare is changing its entire menu. I’ll be sharing their survey results with you next week, but I’m already interested to see what they will add/change to the menu for June. 3. The book – I haven’t given you an update in ages, but this whole time I’ve been doing tons and tons of work that I haven’t talked about. I feel like I’m emerging from a haze. How have I done it? On the weekends of course! With my terrific husband watching our son. It’s so lovely to relax on the weekends again. By relax I mean doing laundry and cleaning, but still. I don’t want to make any blanket statements about the book that vaguely describe how “great” it is. I’m just going to say how I feel about it this very moment. Proud. Satisfied that I wrote a book. And it’s one I would want to read because I created a page turner. You have been waiting so long. Thank you. It’s just a couple more months. There’s suspense in the book, but you will finally get all the answers to your questions. Every secret revealed. I can’t wait to be done with the anonymity thing. It’s been great and all, but I’m ready (almost). My son is crazy about olives to I added extra ones for him. 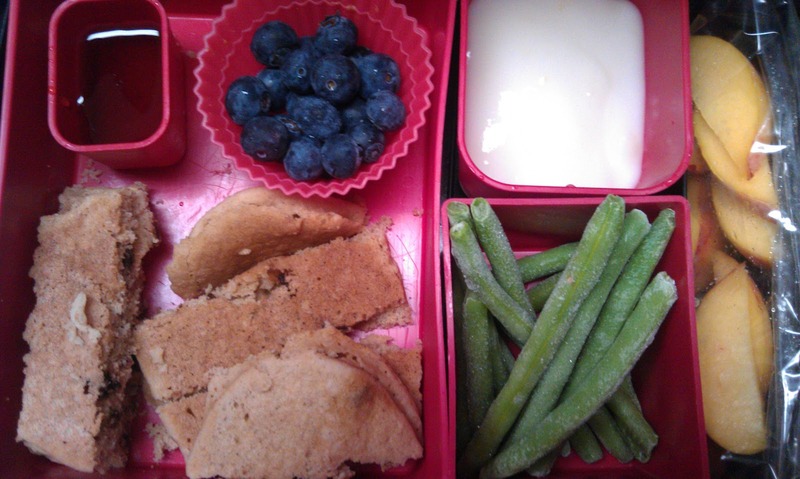 Day care menu: Cod nuggets, blueberry muffins, pineapple, green beans with fruit and ice cream for snacks. This lunch looks small to me, but other times I think I overpack. 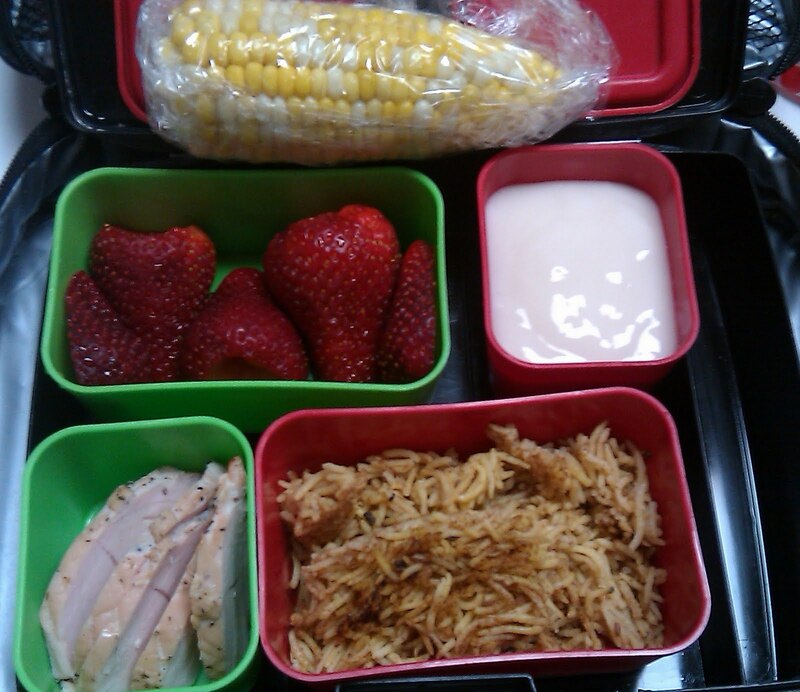 Day care menu: Chicken nuggets, buttered rice, peaches, carrots, with yogurt and pretzels with cream cheese as snacks. My son has been begging for pancakes so I finally got my act together and sent one with him. 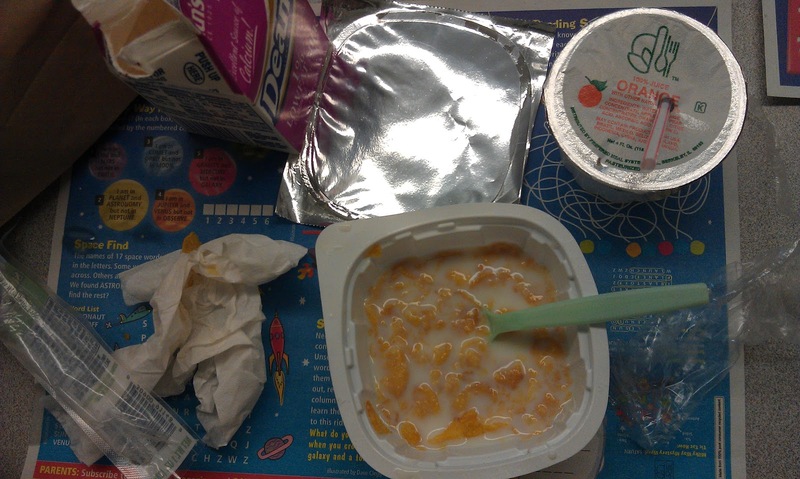 Day care menu: Ham and beans, mandarin oranges, peas with fruit and yogurt as snacks. 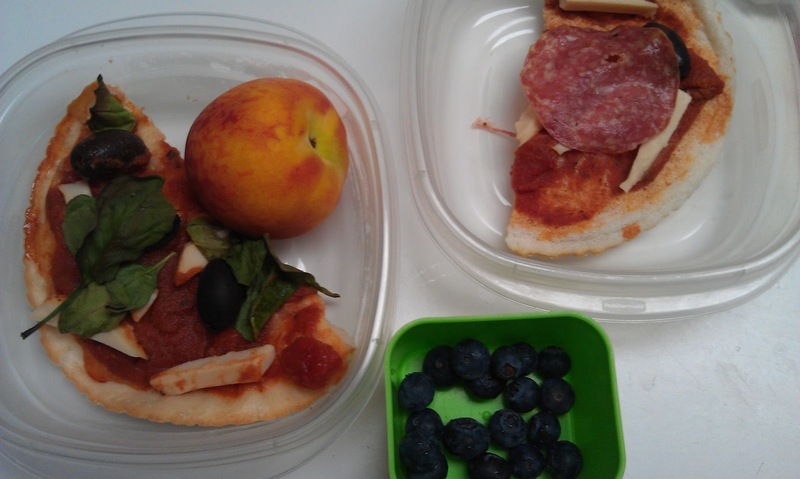 My husband packed this lunch for our son since I was out of town for BlogHer Food. He did a great job! I didn’t even ask him to take a picture but he did. I don’t talk too much about my husband, but I’m absolutely crazy about the guy. Thankfully it’s mutual. I’m really, really lucky to have him. Being a child of divorce, I work hard to make sure that my husband knows how much I appreciate him. I saw how my parents screwed up and I’m not doing that! 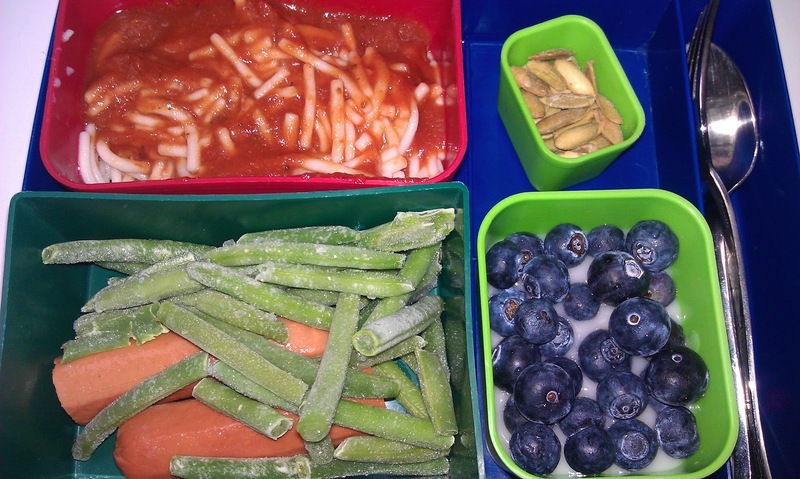 Day care menu: Tuna with pasta, pineapple, green beans with fruit and mini blueberry muffins as snacks. 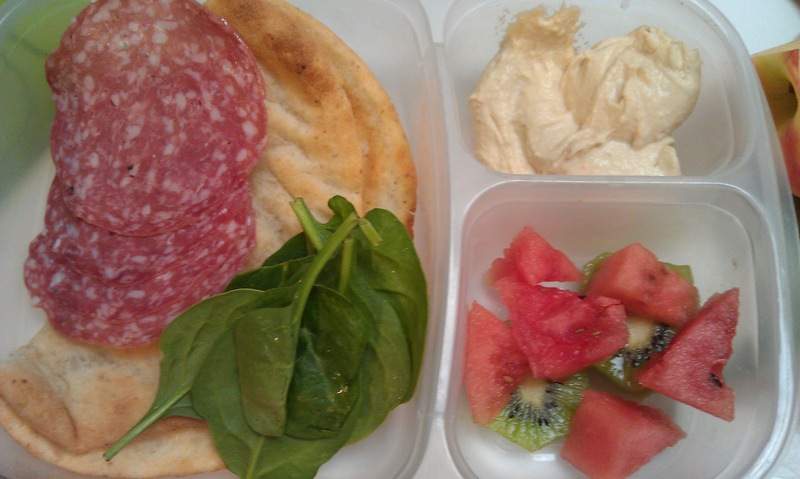 I made these little pita pizzas for dinner. They actually were a lot more filling than they look. I buy bread from a local gluten free bakery. It’s insanely expensive so it’s really something I don’t do very often. It’s really good though. The quinoa salad was from Whole Foods. I’m not a big yogurt person, but I’ve realized that I like it as a topping over fruit. File under “ingredients matter.” I packed a hot dog, but it’s not just a regular frank. It’s one of the fancy kinds (no nitrites, free range beef, no fillers, gluten free) and also definitely a splurge at the store. But worth it every now and then. My husband has been working late this week. So yesterday I took my son to Noodles and Co for a “date.” We ordered their Pad Thai. QSR or Quick Service Restaraunt. This is fast food. McDonald’s, Wendy’s, Burger King, Taco Bell, Subway. They don’t want to call it fast food because of the stigma, so they refer to it as QSR. It has a low price point. Fast Casual. This is a step up from fast food. More expensive and slightly better quality food but no table service. Chipotle is the gold standard. Casual Dining. This includes the big chain restaurants, but could also be smaller local restaurants that don’t have the price point that you would get with the top category of Fine Dining. Chili’s. TGIFridays, Chevy’s, are examples. Sit down places with a lower price point. Family dining (like Buca de Beppo) is a variant of this. Fine Dining. This has a higher price point, better service and atmosphere. 1. Schlosser discusses the eagerness of fast food companies to avoid hiring skilled workers and to rely instead upon highly unskilled workers. In fact, some chains openly embrace “zero training” as their ultimate goal. Since these companies are providing a steady paycheck, is it really the obligation of fast food chains to take an interest in their workers and to teach them job skills? Also, since many of the workers are recently arrived immigrants, doesn’t employment at fast food restaurants offer them a toehold in the American economy and an opportunity to move onto a better job? 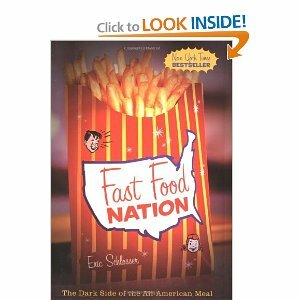 Many of my students’ parents work in the fast food industry. One example was from my first year of teaching when a student’s mom worked a fast food job, was illiterate and spoke no English. I didn’t know her immigration status, but I think that she was supporting the whole family with her paycheck. I wish her employer had considered helping her learn how to read and write as well as how to speak English. It would have been a great help to her kids. When parents are illiterate and/or speak another language, they can’t help their kids with their homework, which is a significant handicap. With each passing year, homework gets more challenging and many projects are meant to done at home with parental assistance. 2. 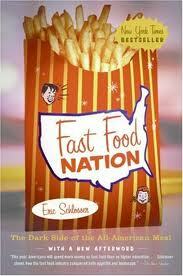 Over the last several decades, fast food companies have aggressively targeted children in their marketing efforts. Should advertisers be permitted to target children who lack the sophistication to make informed decisions and are essentially being lured into eating high fat, high calorie food through toys and cute corporate mascots? Is it possible that fast food companies – like tobacco companies – are recruiting increasingly younger consumers in order to insure a steady customer base as their older constituents die from heart disease, diabetes, and other obesity-related disorders? Recently the government issued voluntary guidelines meant to limit the marketing of food to children. Voluntary? Is that a joke? How great would it be if we could walk into a grocery store and all the packaged food was in plain white or brown cardboard boxes with black letters set in simple block font. No frills. Just plain words. The produce would be the most colorful thing in the store! Fruit and veggie sales would skyrocket! Kids are not offered chocolate milk for breakfast; the only option is white milk. My students like cereal and I’m happy that the string cheese is there. When I’m at home eating breakfast in the morning, I’ll eat cereal by itself most of the time. Instead of cheese, I’ll eat fruit with my cereal. For breakfast today I ate cereal and half a peach. Thoughts on cereal? One of the people I met used to work with fast food companies. He told me about this segment of the population that the marketers refer to as “fast food lovers.” These are people who eat fast food 50 times per month. I guess marketers and fast food companies really love these guys. I can’t even imagine how bad things would have to get for me to eat fast food thirty times per month. I think it would be incredibly expensive, but I have encountered people who believe that the dollar menu is affordable. The problem is that many folks enter a fast food establishment (or drive up in their car) planning to order off of the “value” menu and walk away with $10 worth of burgers, fries, soft drinks, and random desserts. So for the month of June I want to challenge all of us to tally up how often we consume fast food. 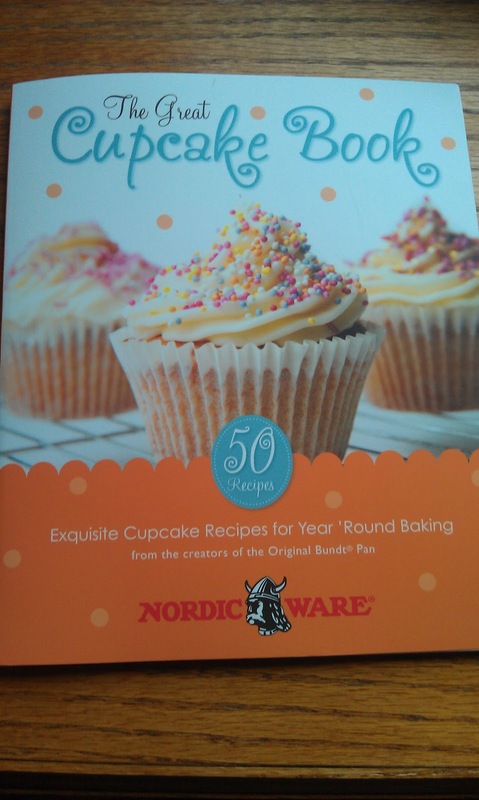 It’s a great tie-in with our book club choice. First, I’d like you to make a prediction about how frequently you think that you and your family will be eating fast food. Since June is a summer month, I’m thinking that our consumption of fast food might be different in June than a different month of the year. For example, maybe you’ll be traveling more or doing more activities in comparison to your average spring/fall/winter month, which means you’ll have to eat out more often. Or maybe because it’s the summer you’ll be in less of a hurry; you’ll have more time to eat at home, maybe even grill out. Consider those factors when making your prediction. I don’t know where Chipotle falls on the list, but we occasionally eat there because they control ingredients so well I can eat there now that I’m gluten free. My husband also enjoys Potbelly’s, which is a Midwestern chain and don’t make the top ten national list. I’m sure Potbelly’s would be higher on a local list. Keep that in mind. Third, tally it up in the month of June. You can use a home calendar to keep track. 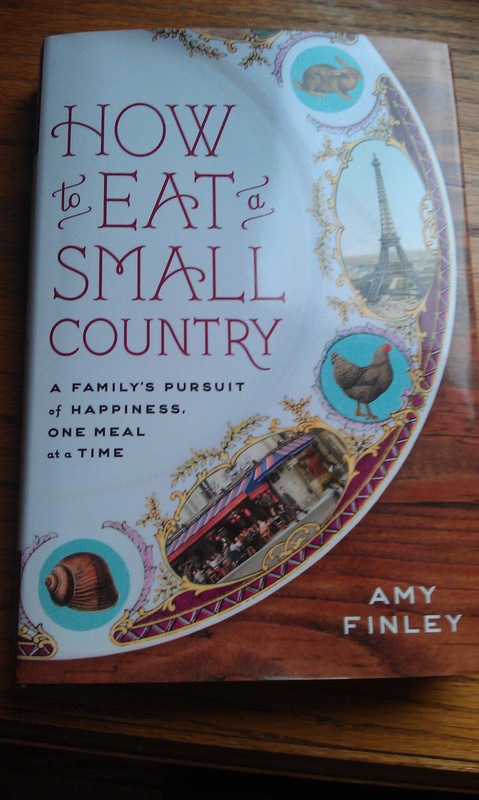 You can share this information with me on Twitter with the hashtag #fastfoodlover about the book and about tallying your eating out and on the blog project’s Facebook page too! 2. Local establishments — My husband has a soft spot for a local greasy spoon. There’s just one store and it’s one guy behind the counter. I will include count purchases there in my tally list (it’s fast food after all) but I’m going to leave it up to you whether or not you want to count non-franchised fast food. It’s fast food (not a sit down restaurant) but it’s super local and what I like is all the money my husband spends there stays in the community. Maybe you can tally it with an asterisk…thoughts on this? I had the honor and privilege to be a part of a terrific panel about school lunch and student health at Mom Congress back in April. I didn’t write a recap post right away, because it was too hard to put everything into words. It felt like a dream to be able to meet terrific moms from all over the country and to watch the speakers who I had only read about. My panel included Seth Nickinson from Jamie Oliver’s Food Revolution, Kelly Meyer from Teaching Garden, and Margo Wootan from Center for Science in the Public Interest. Most of what they said about school food I had already heard and knew. I was so honored to be on the panel. Unfortunately, I was the last one to speak and time ran out for me to share most of my ideas about school lunch reform with the delegates. Then there wasn’t much time for questions, which was a huge bummer. The questions we did receive were excellent and thankfully I was able to contribute then. I don’t have anything to share with you from my panel because I was not taking notes then! I was a ball of nerves! 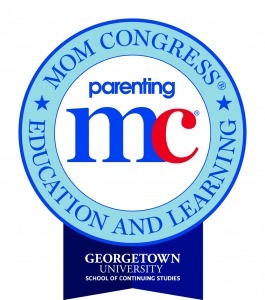 Parenting magazine selected one mother for each state in the union to be a “mom delegate” after a nationwide application process. In our pre-conference conference call we were informed that the Mom Congress attendees were already established advocates in their communities. That was no joke — the women in that room were amazing. Most of the attendees didn’t have a web presence, but a couple did. Imagination Soup and Inspiring Moms were two moms who were selected. (Forgive me if I’m forgetting some other moms who are also online). After I spoke (thankfully the first session), I spent the rest of the conference soaking up the speakers. Secretary of Education Arne Duncan – One of the amazing things Secretary Duncan shared was that when President Obama went to South Korea, he asked their leader what was the biggest problem that South Korea faced in terms of education. South Korea’s leader said that the biggest problem was that parents were complaining about the state of education. For example, he said that even the poorest parents were insisting that their children learn English not in second grade, but in first grade. Secretary Duncan said he wanted our country to have that same problem. He said that there are failing schools, but that in surveys most parents say they are satisfied with their children’s education. He said it’s a case of cognitive dissonance. Take a moment. The Secretary of Education wants more angry parents. Another thing that stuck with me that Secretary said — the school does not belong to the principal. The school building belongs to the community and to the kids. I’ve thought long and hard about that statement; I could not agree more. Secretary Duncan elaborated by saying that schools should be open longer than just school hours and that non-profit organizations (YMCA and community centers) should be running after-school, evening, and weekend programs where appropriate. How many of our schools are just closed and locked outside of school hours in communities where the kids are in desperate need of additional enrichment? Sure there are security issues and things get stolen sometimes, but appropriate safeguards could be in place to prevent that. The gym, the auditorium, even the computer lab sit silent in communities that lack close access to these resources. I can’t see my principal giving up the keys without a fight but, managed appropriately, it could only benefit the students and their families to get extended access to the school building. He also mentioned that our schools are doing too much testing — I couldn’t agree more! Students First Michelle Rhee – Whatever you think of her, I found her to be more compelling in real life than much of the press she has received. Michelle Rhee was the chancellor of DC Public Schools and made some sweeping reforms that angered many teachers and parents. In person I found her to be less bellicose than everything I have read about her. She believes that bad teachers and administrators are killing our schools. Although she gets a lot of press for firing lots of teachers, she mentioned that she fired a third of the principals in that district. I think that she is a little too blunt and has to work on her tone and approach. The Mom Congress delegate from DC got up and asked a question about how to continue the reforms that Rhee put in place. Unfortunately, the average length superintendents stay in their position is three years. Not long enough to see their changes through. It sounds like now that she is gone some parents appreciate her work more fully. I subscribe to emails from Students First (Rhee’s organization). Frankly, I find many of her emails to be grating. I think she could work on not being harsh. However, in person I agreed with much of her speech. She asked the audience if any mom attending would be okay with their child being in a class with a teacher who was being professionally developed because they weren’t successful in the classroom. The teacher gets a “do over,” but the kids don’t get that year back. 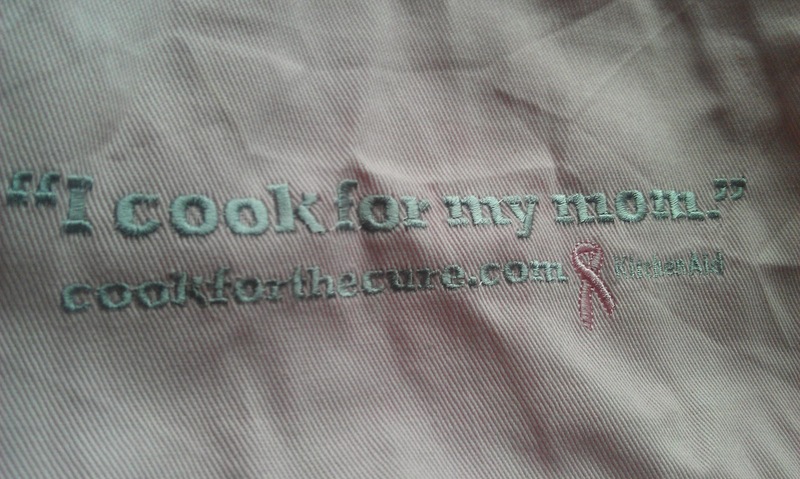 There were so many amazing moms and speakers there. It was hard for me to wrap my head around everything I heard, discussed, and (hopefully) contributed. I haven’t had time to review my notes more exhaustively. Actually, I usually don’t take too many notes. I only write down what I really, really want to review later. I hate having paper clutter. If I review my notes and find some other nugget of information I found valuable, I will share it at a later date.